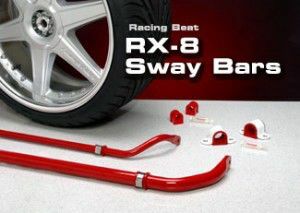 RX8 Font Sway Bar Racing Beat-designed sway bars reduce chassis roll during cornering and increases your car’s sensitivity to steering inputs, thereby improving maximum cornering power. Substantial engineering effort, select steel alloys, and precise manufacturing processes are combined to produce top performance components. All Racing Beat sway bars are finished with a distinctive, red powder coating that provides a smooth, glossy protective layer. You can be assured of many years of superior handling performance with these proven bars! The addition of a larger aftermarket sway bar can increase the stress loads on the original OEM sway bar endlinks. To combat these increased loads, Racing Beat has designed a set of OEM style aftermarket endlinks to absorb the increased demands of a larger front sway bar. Incorporated into the design of these links are larger 12mm mounting studs and matching retaining nuts. The sealed bearing is self lubricating and should offer many miles of maintenance free driving. Each set is sold as a front pair. These endlinks are intended for street and autocross applications and are highly recommended for use with the Racing Beat bar. Although these upgraded endlinks can be used with the stock sway bar, we believe that the original links are adequately suited for use with the stock bar. Due to the larger diameter studs provided on the Racing Beat endlinks, both the sway bar ends and the mounting holes on the chassis must be enlarged to accept the mounting studs. Provided in the endlink kit is the appropriate sized drill bit and a drilling guide to accomplish this task. Also included are detailed instructions complete with drilling suggestions and torque specifications. Racing Beat-designed sway bars reduce chassis roll during cornering and increases your car’s sensitivity to steering inputs, thereby improving maximum cornering power. Substantial engineering effort, select steel alloys, and precise manufacturing processes are combined to produce top performance components. All Racing Beat sway bars are finished with a distinctive, red powder coating that provides a smooth, glossy protective layer. You can be assured of many years of superior handling performance with these proven bars!